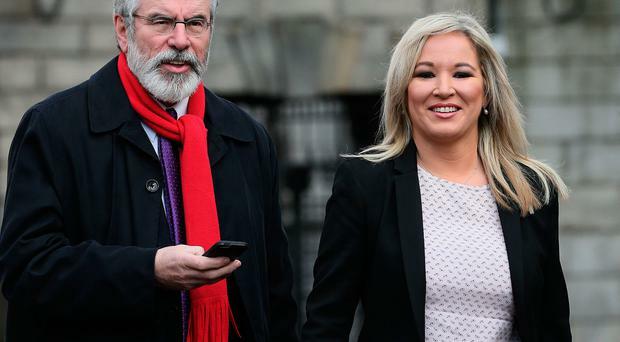 Unionists are still in the majority following the Assembly election, writes former Taoiseach John Bruton, and Sinn Fein must be careful not to entrench division further in pursuit of an unaffordable objective. In the recent Assembly election, the Democratic Unionists got 28.1% of the vote, Sinn Fein 27.9%, the Ulster Unionists 12.9%, the SDLP 11.9% and the Alliance Party 9.1%. The fact that Sinn Fein increased its share of the vote by a substantial 3.9 percentage points has led some commentators to interpret this as a mandate to start negotiating towards a united Ireland. There is some wishful thinking going on here. Of the 90 seats in the new Assembly, 49 were won by parties that broadly support the continuation of the Union with Britain, while only 39 were won by parties who want to replace that with a union with the rest of Ireland. Putting a choice between the two unions at the heart of the current political debate in the north is likely to deepen sectarian divisions and make day-to-day compromise even more difficult to achieve. To use a phrase Gerry Adams often used in another context, it is "not helpful to the peace process": if by "peace process" we mean, in the first place, a reconciliation between the two communities in the north. Centring debate around whether one is for or against a united Ireland would make any attempt at creating an alternative to the Sinn Fein/DUP duopoly of power next to impossible. Indeed, that may be one of the reasons the drum is being beaten for a united Ireland. It is a good way of freezing politico-sectarian divisions. And that suits both Sinn Fein and the DUP. Of course, as a tactic, it may also help Sinn Fein electorally in the Republic, because distant, unattainable, objectives, such as a united Ireland, or the restoration of the Irish language, have been useful, and reusable, rallying cries for other parties in the Republic in the past (notably by Fianna Fail when De Valera led them). The economic case made for immediate agitation towards a united Ireland - that the two parts of this island would become more prosperous together than apart - seems to ignore the huge subsidy the north receives from Britain (20% of its GDP). The Republic, with a much smaller population and tax-base, could not replace this - especially if it itself is suffering the dire after-effects of Brexit. A united Ireland would, in the context of Brexit, simply move the border from Newry to Larne. The costs on east/west trade between Ireland and Britain caused by Brexit would all remain, but the British subsidy to the north would be gone. Now, I know money is not everything. If the people of the north are united in wanting to make new constitutional arrangements (whatever they are) work, they will work. But Irish unity imposed by a simple majority of the population, overruling a large minority, who still want to remain with Britain, would not leave behind a united people, willing to make big sacrifices for the common good of a united Ireland. In my view, a united north must come first and only when we have such unity can wider constitutional options be considered in a pragmatic way. The recent election did not help in that regard and a Sinn Fein campaign for a united Ireland will deepen divisions further. We should recall the futile anti-partition campaign of the late-1940s, which did just that. Pro-unity commentators have attempted to address the financial problem of replacing the British subsidy in the event that the north left Britain and joined a united Ireland. It has been posited that Britain would still have a financial responsibility to offer, a severance payment of sorts, to the north for at least a decade, or possibly two. Given current attitudes in Britain, this seems to me to be wholly naive. If Britain is reluctant to pay its share of the EU bills, which were contracted while it was a full voting member of the EU, it will hardly be willing to pay the costs of an entity that has seceded from its control. It is hard to see Britain contributing for years to a place that had left it, at the very time when it was also trying to prevent Scotland doing the same. A post-Brexit Britain will, I believe, be a poorer country than it is today. Could there be savings in a united Ireland through economies of scale and merged services, one parliament, one health service, one education service, and so on? This is contrary to the scenario envisaged in the Good Friday Agreement, which provides for the retention of separate northern institutions and for guarantees, if ultimate sovereignty is transferred from London to Dublin. One also needs to consider the potential security risks and consequent increases in police and military spending in the Republic, if a significant minority in the north decided to resist the arrangements. Resistance would be geographically concentrated and hard to contain. For example, in the election last week, parties supporting a united Ireland received only 3% of the vote in East Belfast, only 10% in Strangford and only 14% in Lagan Valley and in East Antrim. These security costs would fall on the Irish taxpayer. Could moderate unionists be convinced about the benefits of reunification? They, at least, would recognise that the British have little interest in the north. This is true. I do not sense a deep emotional commitment in Britain to any part of Ireland, or to its interests, as the Brexit vote has shown. But loud talk and flag-waving about a united Ireland by Sinn Fein would undermine these very "moderate" unionists. One would not just be asking moderate unionists to be reasonable about some pragmatic arrangement. One would be asking them to cease to be unionist. That would be asking them to change their identity, as they see it. Identity is no small matter. That is why I would worry about the security implications of the course advocated by Sinn Fein and others. There is more urgent work to be done. Let us hope, now that the elections are over, that a pragmatic and united case about how to deal with Brexit can first be agreed between unionists and nationalists in the north and then put by them to Brussels, London and Dublin. That is the job of a new Assembly, including Sinn Fein. They should get on with it.